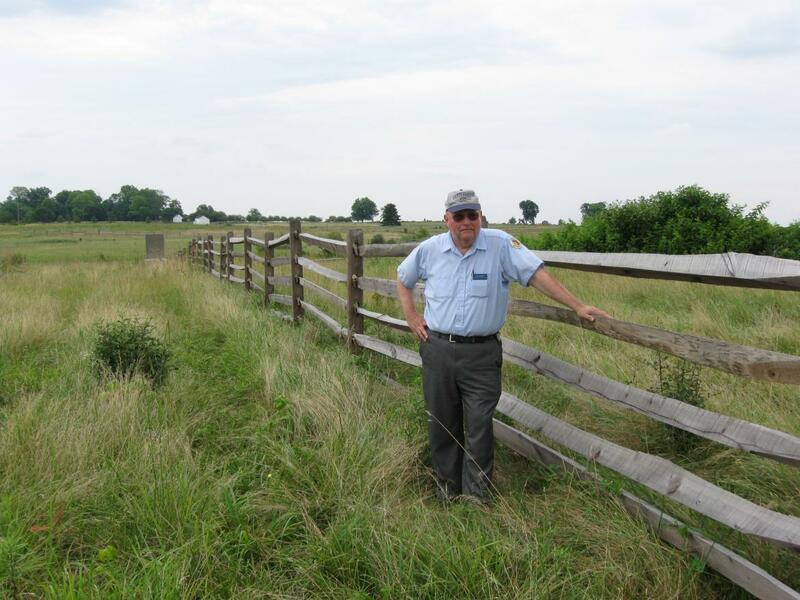 Gettysburg Licensed Battlefield Guide Elwood “Woody” Christ is the author of the book, Over a Wide, Hot,…Crimson Plain: The Struggle for the Bliss Farm at Gettysburg, July 2nd and 3rd, 1863. He is the host for our series on the fighting for the Bliss Farm. Woody is standing near the Bliss Barn site. The bank of the Bliss Barn is the area covered by green foliage to the right of the fence. The monument to the 12th New Jersey Infantry Regiment is in the background to the left of the fence. Cemetery Ridge is in the background. This view was taken facing east at approximately 3:45 PM on Monday, July 20, 2009. Although many individuals know the fields of Pickett’s Charge, fewer know the action which took place in those fields around the Bliss Farm. Gettysburg Licensed Battlefield Guide Elwood “Woody” Christ begins a series on the struggle for the Bliss Farm. His book, Over a Wide, Hot,…Crimson Plain: The Struggle for the Bliss Farm at Gettysburg, July 2nd and 3rd, 1863 was published by Butternut and Blue in 1993. 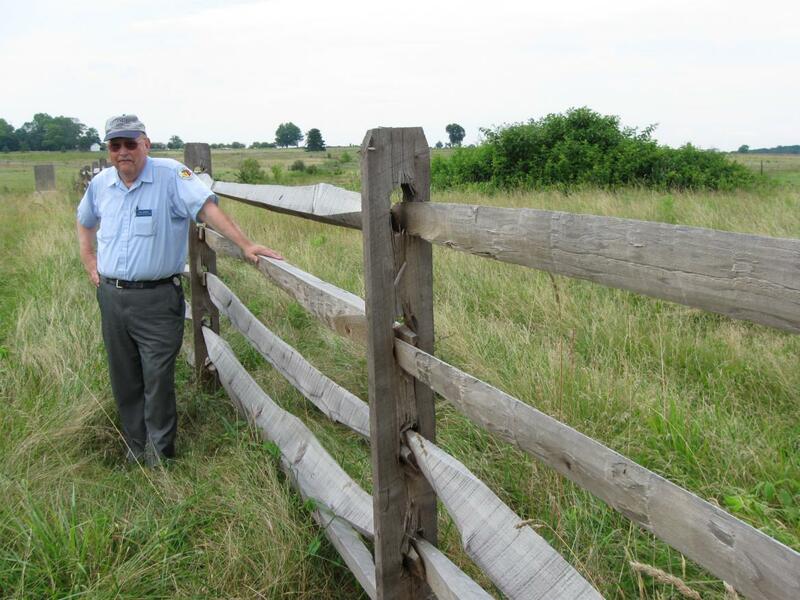 Woody is a Gettysburg College graduate, and has been a Licensed Battlefield Guide since 1982. In our first post Woody Christ concentrated on some terrain in the area of the Bliss Farm, specifically in what is now the subdivision, Colt Park. In our second post he continued his emphasis on the “broad flat knoll” which is Colt Park. 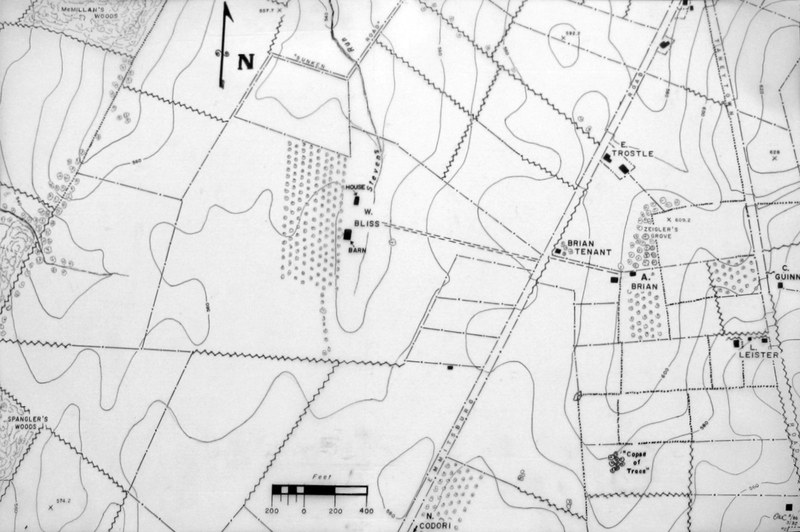 In our third post he showed us the first positions of the United States troops that would be involved at the Bliss Farm. He also showed the route that many of them used to access the Bliss Farm from Cemetery Ridge. In our fourth post he took us to the sites of the Bliss House and Barn. In our fifth post, he described the arrival of the Confederate and United States at the Bliss Farm area. In our sixth post he described the beginning of the skirmishing at the Bliss Farm on July 2, 1863. In our seventh post he finished describing the fighting on the second day. In the eighth Bliss Farm post Gettysburg Licensed Battlefield Guide Woody Christ described some incidents on the skirmish lines the evening of July 2nd and early morning of July 3rd. He also told how the 12th New Jersey occupied the Bliss buildings the morning of July 3, 1863. In today’s post Woody described how the 14th Connecticut Infantry Regiment came out to the Bliss Farm to burn the buildings the morning of July 3, 1863. This map was provided to us by Woody Christ for the Bliss Farm posts. This map shows the location of where our Bliss Farm videos were produced. Videos #1-#6 were shown in our previous Bliss Farm posts. 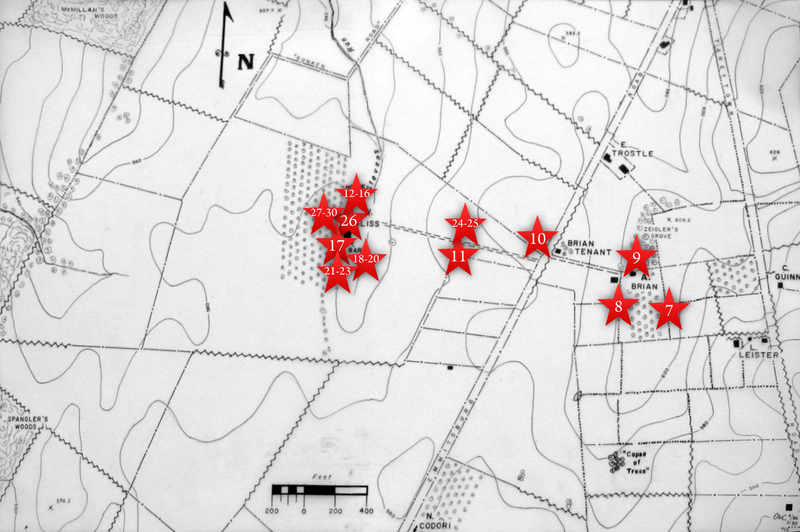 Video #7 was taken at the crest of Cemetery Ridge near the stone wall south of the old Cyclorama building. Video #8 was taken at the monument to the 1st Delaware Infantry Regiment. Video #9 was taken north of the Brian/Brian House. Video #10 was taken along the Emmittsburg Road near the Brian/Bryan farm lane. Video #11 was taken at the fence marking the skirmish line of the 14th Connecticut. Videos #12-#16 were taken at the site of the Bliss House. Video #17 was taken south of the Bliss Barn. Videos #18- #20 were taken southeast of the Bliss Barn. Videos #21- #23 were taken farther south of the Bliss Barn than #17. Videos #24- #25 were taken near the fence marking the Union skirmish line the evening of July 2nd and the morning of July 3rd. Video #26 was taken north of the Bliss Barn. Videos #27- #30 were taken northwest of the Bliss Barn. This map was created facing north at approximately 7:00 PM on Tuesday, August 18, 2009. In Video #27 (Videos #1-#26 were shown in our previous Bliss Farm posts) Gettysburg Licensed Battlefield Guide Woody Christ is standing near the Bliss Barn. He is by a fence that runs west to east (Seminary Ridge to Cemetery Ridge). Woody tells how the 14th Connecticut occupies the Bliss Barn and the Bliss House. At the beginning he mistakenly called the 14th Connecticut the 12th New Jersey. This view was taken facing east to northeast at approximately 3:45 PM on Monday, July 20, 2009. 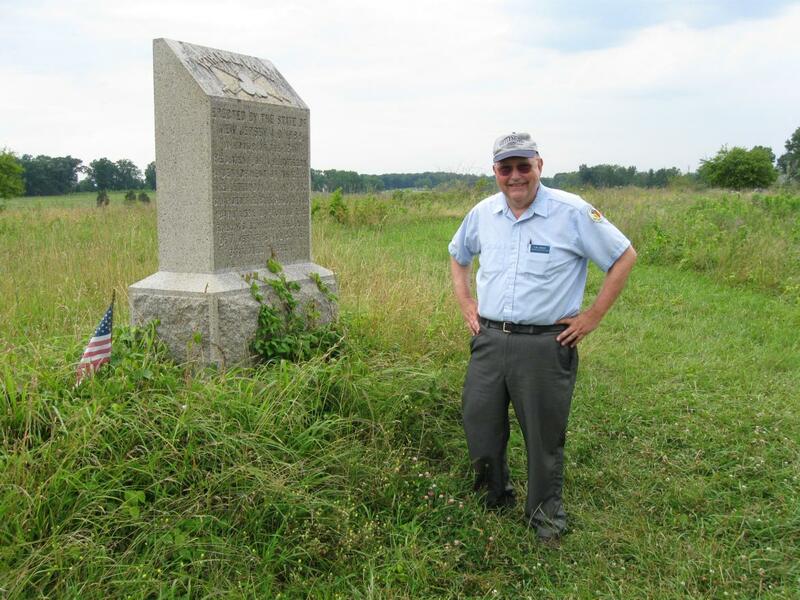 Licensed Battlefield Guide Woody Christ is standing by the marker to the 12th New Jersey Infantry Regiment. This view was taken facing southeast at approximately 3:45 PM on Monday, July 20, 2009. In Video #28 Licensed Battlefield Guide Woody Christ is still standing near the Bliss Barn. He is by a fence that runs west to east (Seminary Ridge to Cemetery Ridge). Woody describes how the members of the 14th Connecticut who were occupying the Bliss House became outflanked and join the rest of the 14th Connecticut which occupied the Bliss Barn. The Confederates then occupied the Bliss House. This view was taken facing east to northeast at approximately 3:45 PM on Monday, July 20, 2009. Woody Christ is still standing near the Bliss Barn by a fence running from east to west (Bliss Farm to Seminary Ridge). The marker to the 12th New Jersey Regiment is on the left. The remains of the bank barn are on the right. Cemetery Ridge is in the background. This view was taken facing east at approximately 3:45 PM on Monday, July 20, 2009. In Video #29 Woody Christ is still standing near the Bliss Barn. He is by a fence that runs west to east (Seminary Ridge to Cemetery Ridge). Woody shares one story of how orders might have been delivered for the Bliss Buildings to be burned by a staff officer in Smythe’s Brigade. This view was taken facing east to northeast to east at approximately 3:45 PM on Monday, July 20, 2009. In Video #30 Woody Christ is still standing near the Bliss Barn. He is by a fence that runs west to east (Seminary Ridge to Cemetery Ridge). Woody shares the other story of how orders might have been delivered for the Bliss Buildings to be burned by a Sergeant in the 111th New York. This view was taken facing east to northeast to east at approximately 3:45 PM on Monday, July 20, 2009.